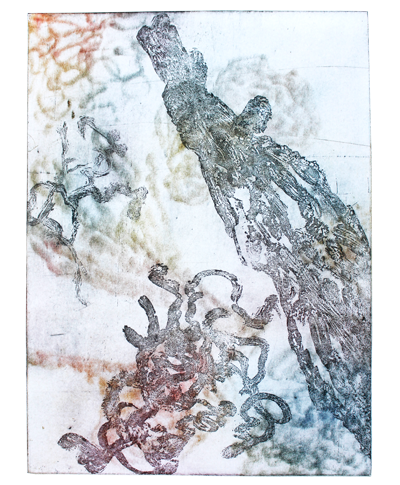 We speak to printmaker Julie Mia Holmes about the ideas and processes behind her upcoming exhibition Flotsam & Jetsam, which will feature a collection of etchings and embroideries. Can you tell us about your new show Flotsam & Jetsam? ‘Flotsam & Jetsam’ is a collection of etchings and embroideries inspired by a year of beachcombing and the reading of novels. Beachcombing has a lot to answer for! It is beginning to become a problem…..my studio is starting to fill up with smelly decomposing corals and sea detritus. Things I simply CANNOT leave behind on a walk, they must be drawn! Every year a large number of migrating Short-tailed Shearwaters (Mutton Birds) get washed up on our beaches. I’m talking truckloads, it’s pretty depressing. They’re doing the long haul from the Arctic to Antarctic. They have the longest migratory path of any bird. No wonder they’re so exhausted by the time they get here. Looking at them on the beach I thought they looked beautiful, serene and at peace – this is in the early stages of death I might add, very much like us in sleep. I took many photos (these guys were NOT coming home with me!) and started some drawings. Picking up a needle and thread just felt like the right thing to do. I wanted to reference medicine and mending things, trying to make something whole again. And then I couldn’t stop! Embroidery gets very addictive. While looking at the Shearwaters I kept thinking about how other sea forms like corals, sponges and seaweeds mimic our own internal organs. Finding them washed up on the beach was as if the sea had belched up it’s own organs. I started to draw the things I collected and made trips to some fantastic rock pools nearby, paying particular attention to different textures, colour and form. The other important inspiration in this collection of work is my reading life. Working in a Bookstore means lots of reading! I started feeling slightly guilty about reading because it was taking up so much of my art making time – it’s much easier to sit down with a good book than problem solve with a drawing. Then I thought why not use the books I love to make some prints. SO the Book Project started. Every book that I enjoy gets a print made from it. It might be a particular phrase that floats my boat or just a general picture that pops into my head. They’re usually connected to animals or birds and I’ve managed to make 18 so far. It is an ever-growing project! Etching is my favourite printing method and Aluminium plates have become the base for all of my etching adventures. Aluminium is a lot cheaper than more traditional metals like copper and zinc and you can use less harmful chemicals like copper sulphate in your etchant solutions easily sourced from local hardware stores. You can even pour it on your rose garden when you’re finished with it! I’ve incorporated techniques like Sugarlift, a process where a sugar solution, in my case condensed milk (there was a lot of paintbrush licking!) is applied to the plate and left to dry. Then Bitumen is applied to the whole surface of the plate in an even layer and left to dry. THEN you submerge the plate in warm water and let the sugar solution underneath the bitumen dissolve before putting the plate in an etchant bath of copper sulphate. This creates a beautiful texture on the plate similar to those found in corals and rockpools. There’s also a lot of Drypoint work on my plates. This means drawing straight onto the plate with sharp needlepoint or a handheld drill with different drill bits to create different textures. There are many more printing techniques I’ve used but we’ll be here all day! There is alchemy to printmaking that I love and it’s a constant learning curve. Last week I found out you can’t print white ink from an Aluminium plate. It was something to do with the chemical reaction between the titanium in the ink and the aluminium. The white just kept turning grey! 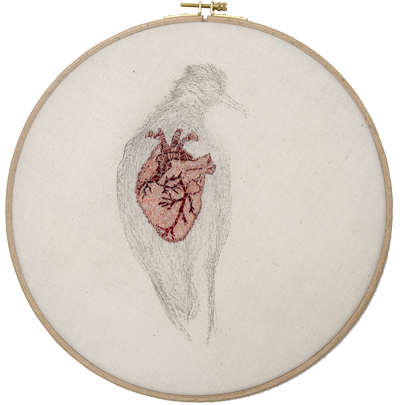 As for my embroideries I approach them like drawings, every stitch is a new line. I sketch a general outline onto the fabric and then create the details and form as I go. After making the etchings it just seemed like the natural progression to join the two together and I started to print onto the fabric and stitch over it. Everything always merges in the end! Printing two large etching plates, one over the other, is always a bit tricky to get the registration right. It’s a nightmare when you pull a beautiful print off the plate only to realise you’ve buggered up the registration. Lots of swearing follows….. The embroideries take a very long time too! I never know how long they’ll take and they always end up taking far longer than I think! I have a problem where I always seem to make things more complicated than what I first intended. And, there is never enough time!